This statistic shows the estimated levelized capital costs for each energy system after its implementation in the United States in 2022. The levelized capital costs for natural gas-fired advanced CC with carbon control and sequestration (CCS) plants are estimated to stand at 74.9 U.S. dollars per megawatt hour for plants entering service in 2022. 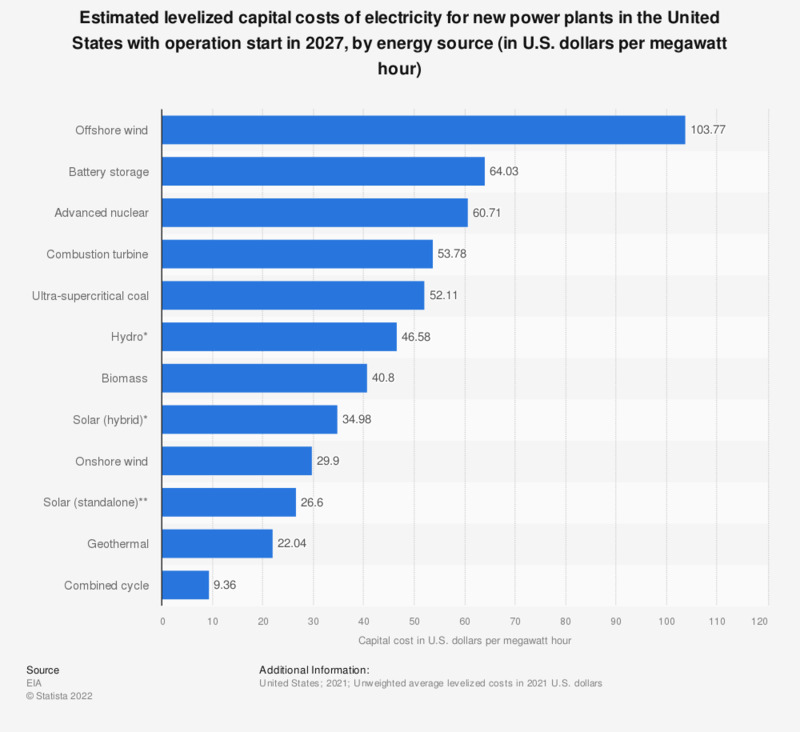 * U.S. average levelized costs (2016 U.S. dollars per megawatt hour) for plants entering service in 2022, based on simple average of regional values. ** Costs are expressed in terms of net AC power available to the grid for the installed capacity. *** According to the source, hydro is assumed to have seasonal storage so that it can be dispatched within a season, but overall operation is limited by resources available by site and season. The abbreviation IGCC stands for integrated coal gasification combined cycle. The abbreviation CCS stands for carbon capture and sequestration. The abbreviation CC stands for combined cycle. The abbreviation PV stands for photovoltaics.